Raasay has a fairly primitive layout. Only pipe cots in the main saloon, quite a cramped fo'c'sle, and a very tiny pipe-cot in the quarter berth space behind the chart table. Without doing a lot of remodelling, or incurring a lot of expense, I wanted to create a temporary double in the main saloon, but wanted the bits to be easy to stow. This is the result - it uses the port side settee cushions plus a squab from a cockpit cushion to make the additional mattress. 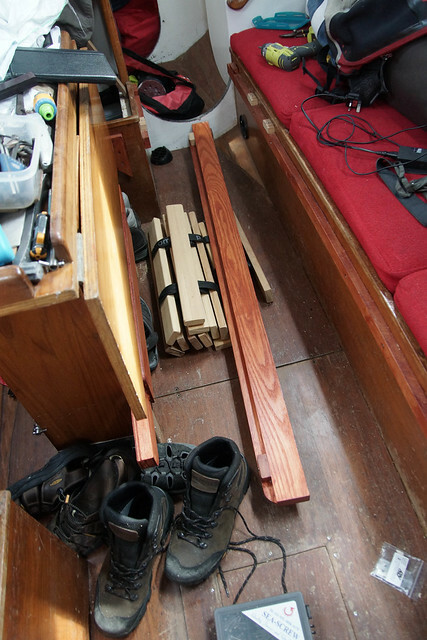 The long support by the table can be stowed in the quarter berth space, and the slats roll up quite neatly with their webbing.